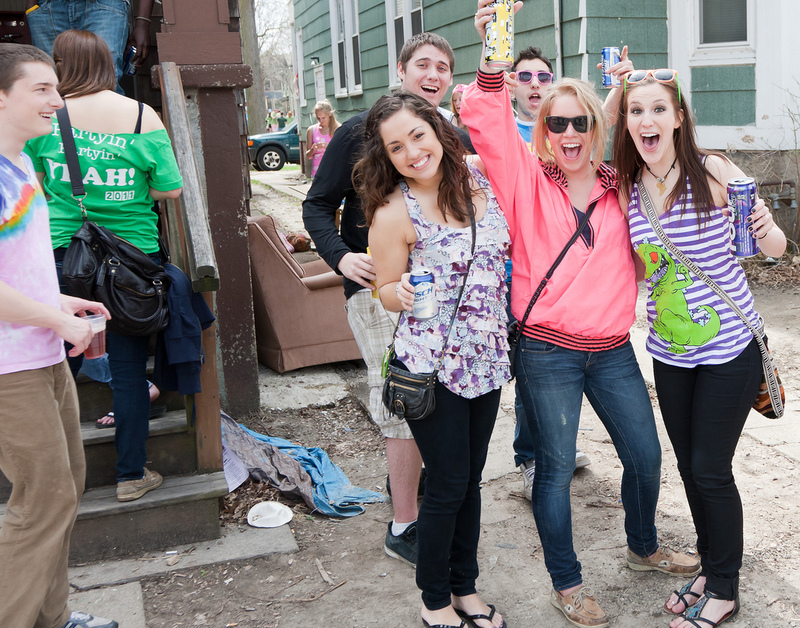 People drink beer at the Mifflin St. Block Party in 2011 in Madison. The event happens a few blocks from the UW-Madison campus and is popular with college students. Binge drinking occurs frequently on and near the University of Wisconsin-Madison campus, but the percentage of students who abstain from alcohol altogether might surprise you. According to Jennifer Rabas, the University Health Services’ alcohol, tobacco and other drugs prevention coordinator, about 25 percent of first-year students and about 8 to 10 percent of the rest of the student population abstain from any alcohol use. Rabas said students who do not drink may feel isolated from the rest of the population because drinkers, specifically binge drinkers, make themselves more visible and often cause more problems. “We’ve done surveys before, and our qualitative data shows that students have felt like if you are a non-drinker, it may be harder to connect,” Rabas said. Jonah Beleckis, a UW-Madison alumnus, agrees that being a non-drinker on the UW-Madison campus can be lonely at times. He said drinking at the university seems to be an assumed experience. Stanley Kaymen, the co-chairman of Live Free, a student organization dedicated toward wellness and recovery, agrees binge drinking is normalized on campus in such a way that people often don’t realize they have an alcohol abuse problem. Kaymen said some students who come in to receive help struggle to say sober. They feel pressure from their friends to drink, and once they stop drinking, it is like they are an outcast in their own friend group. According to Rabas, a large percentage of students who do not drink are students of color or international students. Minority students who choose not to drink may feel like a double-minority because of their sobriety, she said. “The whole ‘You have to drink or leave’ kind of mentality maybe can feel othering for anybody who is a non-drinker, but then if you’re a minority on this campus, it can feel even further othering,” Rabas said. According to Beleckis, students who drink less frequently may feel even more pressure than those who choose not to drink at all. “For people who would drink just a little bit, they would have a really hard time, because they were the ones getting a bag of Franzia (wine) shoved in their face,” Beleckis said. Of the 75 percent of first-year students who drink, 63 percent of them say they don’t participate in high-risk drinking — five drinks or more in a two-hour period, Rabas said. Rabas said the university is working on initiatives including The First 45 Days to educate students about the reality of how many students actually binge drink. In addition, UHS is trying to educate students about the effects drinking can have on other public health concerns, such as sexual assault and mental health. Rabas said it is important to encourage drinkers to be more respectful of non-drinkers instead of putting pressure on non-drinkers to find their own communities and avoid the high-risk behavior. “We put all of the onus on individuals who are affected by it to make the change, when really we need to encourage people who are drinkers to not put pressure on their friends and to be accepting of people’s choice not to drink,” Rabas said.